We Accept Electronics 6 DAYS PER WEEK! Do You Have Items to Bring to the EcoDrop? Although some plastic film items such as grocery bags have the recycling triangle with a number in the middle, they can not be recycled through the Authority’s recycling program. Plastic film can be brought to most local grocery stores for recycling. All recyclable items - paper, plastic, metal, and glass - can be mixed together, loosely, in your recycling container(s). 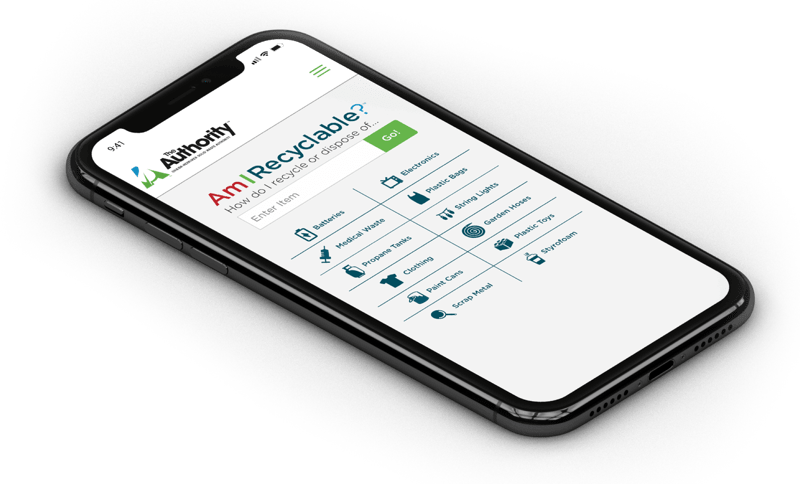 Download the AmIRecyclable Mobile App Today! The Authority's school recycling program makes it easy for schools to recycle. From providing boxes and materials for our green team to conducting recycling assemblies, they have been a huge factor in the growth of recycling at our school. Thank you for providing reuse options. I’ve been avoiding cleaning out my attic because I didn't want to see usable items go into the garbage. You've encouraged me to give my old things a second life! I love using the "Am I Recyclable" tool! It is so easy to be able to type in item and get a quick answer on how to get rid of it properly." I love visiting the EcoDrop Utica! The setup is easy and convenient and I was surprised to learn just how many items can be delivered for FREE all year long for recycling.